Vikings quarterback Matt Cassel throws a pass during the second half of the game against the Cincinnati Bengals at Paul Brown Stadium Sunday. EDEN PRAIRIE, Minn. — With one game remaining in the season, the Minnesota Vikings are sticking with their veteran starter instead of taking a look at either of the younger quarterbacks on the roster. Coach Leslie Frazier said Monday Matt Cassel would start in the season finale on Sunday at the Metrodome against the Detroit Lions. The depth chart will remain status quo, with Christian Ponder serving as the backup and Josh Freeman likely to not see another snap this season with Minnesota, who signed him in Week 5 after Freeman was released by Tampa Bay. "I have to give it some more thought," Frazier responded about Freeman’s status, before adding: "Matt’s going to be our starter for this ballgame. Right now Christian is in that backup role. I don’t know what would change that as the week goes on, but that’s the thought process as we speak." Cassel is coming off his worst performance of the season in his third straight start Sunday on the road at Cincinnati. Cassel was 13 of 27 for 114 yards passing. He threw one touchdown and had four turnovers with a lost fumble and three interceptions. But in a season in which the Vikings have seemingly decided they can’t go forward with Ponder, and Freeman unable to break through in his 12 weeks with the team, Cassel will start again. 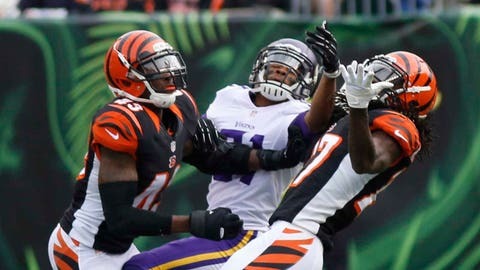 "The team that we were playing, they play some pretty good defense," Frazier said of Cassel’s game on Sunday. "We probably could have protected a little bit better. There were some things we could have done a little bit better as an offense as a whole that maybe could have helped Matt some, but he still has to do a good job protecting the ball. "From that first fumble, sack-fumble, and just find a way to get that ball tucked away. If we take the sack, we take the sack. But protecting the ball is a big deal. He’ll be better this next week, but I don’t know if there was anything schematically that was a whole lot different. We were doing some of the similar things we’ve done in the past. We didn’t have the type of success." Cassel had led Minnesota to wins in two of its three previous games, the only Vikings’ starter with a winning record and more touchdowns than turnovers. Cassel, 31, is signed through next season with a player option on a $3.7 million contract. 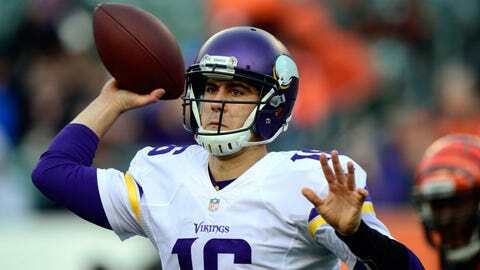 Ponder, 25, also has one year left on his rookie contract for $3.2 million. Freeman was signed in October after an acrimonious departure from the Buccaneers. The Vikings signed Freeman, who cleared waivers, to a $2.8 million contract, essentially paying him $2 million for the rest of the season. Freeman, 25, started one game for Minnesota and has been inactive seven of the past nine weeks. He started on Monday night against the New York Giants two weeks after signing with the team and was 20-of-53 passing for 190 yards and an interception. With Freeman slated to be a free agent at the end of the season, the Vikings got to work with him every day for 12 weeks, and apparently have decided he couldn’t answer the quarterback quandary. "He did a good job picking up things," Frazier said. "It’s one of the reasons we played him in that New York game. He picked up things well and worked hard in practice. He’s still doing those things, picking up the offense, working hard, spending time with coaches doing all the things he needs to do. But with one game left and having a chance to watch Matt play again, we made the decision and that’s probably the way we’ll go." Peterson likely to play: Adrian Peterson didn’t finish Sunday’s game, with Frazier deciding to rest his injured running back once the game got out of hand. Peterson had 11 carries for 45 yards against the Bengals. "There were some moments in that game where he did some good things and there were some other moments where I just wasn’t sure he had the burst we ordinarily would see," Frazier said. "We all want to see if he’s better this week with some more time." Frazier said Peterson, who is recovering from a sprained right foot and groin injury, isn’t being ruled out for Sunday’s finale yet. "Yeah, we’ll see where he is this week when we get back on the field and make a determination if he’s farther along than he was yesterday and just try to do the right thing," Frazier said. Backup Toby Gerhart missed most of the game after restraining his hamstring injury and Frazier wasn’t sure if Gerhart would play Sunday. Linebacker Audie Cole suffered a high ankle sprain and will miss Sunday’s game. Erin Henderson replaced Cole as the middle linebacker against Cincinnati. "I thought he did a good job when he stepped in in the absence of Audie," Frazier said. "Came in, made some nice tackles for us, did a pretty good job of directing defense. I thought he did a pretty good job of moving over from the outside linebacker spot to the middle linebacker spot." Frazier also said safety Harrison Smith was sore on Sunday as he tries to play through a toe injury. Smith missed eight weeks on injured reserve and was sore after returning a week earlier against Philadelphia. "He was a little sore yesterday," Frazier said. "Played through it, but he was sore for a period of time. Worked well in practice and he’ll be a little sore this week, but he’ll be ready to go for the game. But he’s still a little sore." Frazier is hopeful rookie cornerback Xavier Rhodes will be able to return after missing two straight games with a sprained ankle. "We definitely need him, so we’ll see if he’s able to practice tomorrow or when we come back after practice," Frazier said. "But we’re hoping so."